Following its one million dollar ($1m) funding round last year, Vable has expanded its product development team by recruiting leading engineers specialised in technologies such as Natural Language Processing (NLP) and cloud based infrastructure. The Vable platform has been developed using feedback from some of the world’s top Information Professionals within legal, financial and other industries, to ensure that the features and user experience are engineered to accommodate their needs. 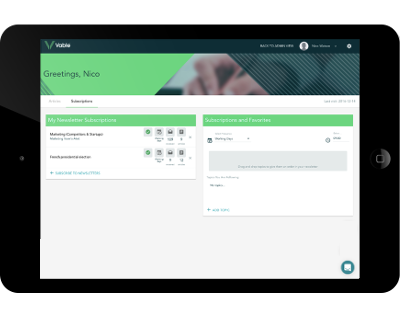 A new self-service portal is integrated into the platform, giving information consumers direct access to curated topics. Matthew Dickinson, CEO and Founder of Vable, says “After a year and half of product development, I am excited to unveil the new Vable platform, designed to surface targeted content to users whilst reducing their overheads in managing and filtering content. I am proud that all of our software developments have been, and will be, based on users’ feedback to deliver the most advanced solution on the market”. The platform builds upon Vable’s core competencies, giving control and flexibility to its clients. It is easily tailored to organisations’ specific needs, be they a top international firm or a company specialised in a niche industry. 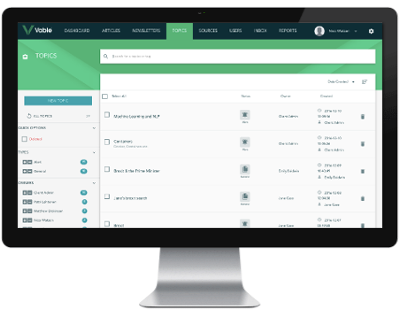 Vable, formerly Linex Systems, is a content automation and intelligence platform that helps companies manage all their sources of information in one place. It compiles all their incoming data and automatically filters out non-relevant information to deliver only the most useful insights. With offices in the UK and the US, and over 300 clients globally, Vable has firmly established itself as the leading current awareness software provider since 2004.